Village Hearth Cohousing began construction in November 2018 on 15 beautiful wooded acres just 20 minutes from downtown Durham, NC. We are building 28 accessible, single-level homes that we planned with the guidance of Katie McCamant and Charles Durrett. Only a few are still available and we are so pleased with the way our community has come together. Our members are committed to mutual support and bring a wide variety of skills and interests to share. We expect to move in late 2018 or early 2020. 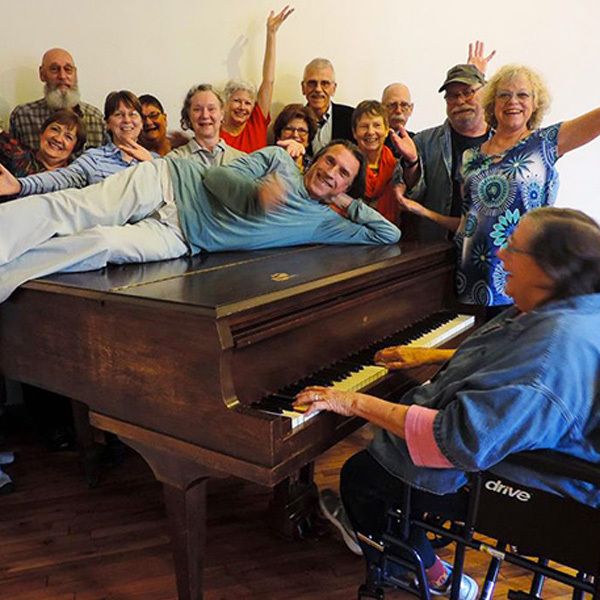 Village Hearth Cohousing is the first LGBT-focused 55+ cohousing community in the United States. Our members include LGBT couples and singles, straight couples and singles, still working and retirees (and our pets). We look forward to eating the food grown in our gardens, building things to enhance our homes and community in the woodworking shop and the art studios, going on hikes, bicycle rides, and kayaking trips at the many nearby natural areas (including access to North Carolina’s Mountain to the Sea trail directly from our land), staying fit in the exercise room, meditating in our woods, or just enjoying each other’s company on our front porches and common house terrace. For more information, visit our website, www.VillageHearthCohousing.com, follow us on Facebook, or join our Meetup group (Durham Village Hearth Cohousing). Contact Pat or Margaret at VillageHearthCohousing [at] gmail [dot] com.